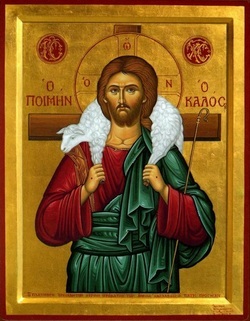 The most obvious connection between Psalm 23 and Luke 15 is the common reference to shepherds. But since the three "lost" parables of Luke 15 are parallel in meaning, we will not be surprised to find similarities between the parable of the Prodigal Son and the Psalm. What is surprising is the number and significance of the similarities. 1) Read Psalm 23, Reflect on the characters of the Lord and the Psalmist, especially their relationship. Make some notes on your reflections. 2) Read Luke 15.11-32. Reflect on the characters of the father and his sons, especially their relationships. Make notes on your reflections and on the parallels you observe between the two texts. If you are working in a group, discuss the parallels you observed and how the psalm and the parable illuminate each other. 3) Read (out loud, in parts, if you are working in a group) the liturgical reading below--several times if you wish. Identify parallels you had already noticed and ones you had not. 4) Write an encounter essay on the interpenetration of the psalm and the parable and how they inter-interpret each other. This reading interweaves one of David’s best known and most loved psalms, Psalm 23, with one of Jesus’ best known and most loved parables, the Prodigal Son. Reader P is the psalmist. Reader 1 serves mainly as the narrator of the parable. Reader 2 voices the words or experience of the two lost sons. At its heart the parable of the Prodigal Son has a profoundly missional message: God longs for the lost, the broken, the marginalized; God is extravagantly compassionate at their return; and God lovingly restores all the lost, the self-reliant and the self-righteous. P The Lord is my shepherd. 1 There was a man who had two sons. P The Lord is my shepherd. I shall not want. 1 and there he squandered his property in reckless living. 2 and he began to be in want. 2 who sent him into his fields to feed pigs. 2 and no one gave him anything. P The Lord is my shepherd. I shall not want. He makes me lie down in green pastures. P He makes me lie down in green pastures. P He leads me beside still waters. P I shall not want. ‘Father, I have sinned against heaven and before you. P He makes me lie down in green pastures. He leads me beside still waters. his father saw him and felt compassion, and ran and embraced him and kissed him. 2 but I perish here with hunger! P I will fear no evil, for you are with me; your rod and your staff, they comfort me. 1 But the father said to his servants, ‘…let us eat and celebrate. and put a ring on his hand, and shoes on his feet. P and I shall dwell in the house of the Lord forever. 2 And he called one of the servants and asked what these things meant. 2 But he was angry and refused to go in. P ...I will fear no evil, for you are with me; your rod and your staff, they comfort me. yet you never gave me a young goat, that I might celebrate with my friends.